There are many things that baffle me. Not including complex calculus, one of the greatest mysteries was Sui Sha Ya. 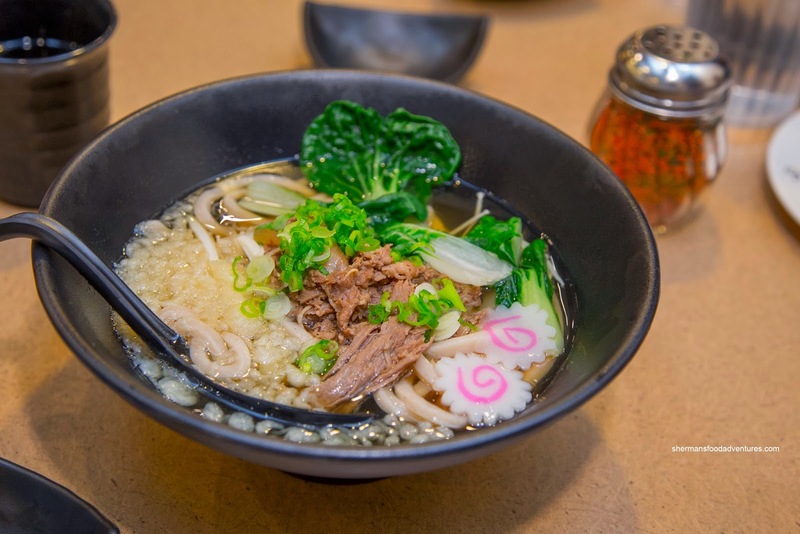 How could a place serving up such mediocre-to-poor AYCE Japanese fare survive for so long? Well, the one at Metrotown seemed to live on forever, much like a Costco lineup (especially at the Bellingham location!). Finally and mercifully, it has recently been replaced by an oddity of sorts - a restaurant dedicated to freshly made udon. 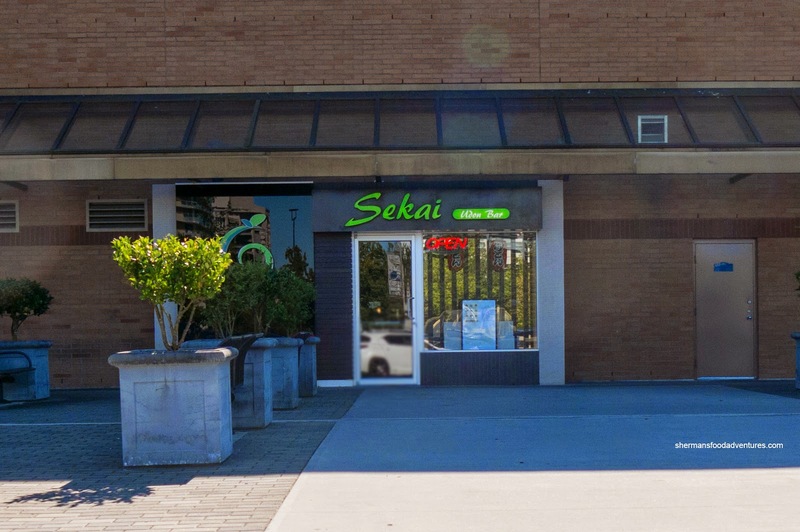 I guess much like the ramen craze, Sekai Udon Bar is attempting to start a new trend in Vancouver. With 4 kids terrorizing our house (darn playdates! ), we decided to head out for lunch at the aforementioned Sekai Udon Bar. 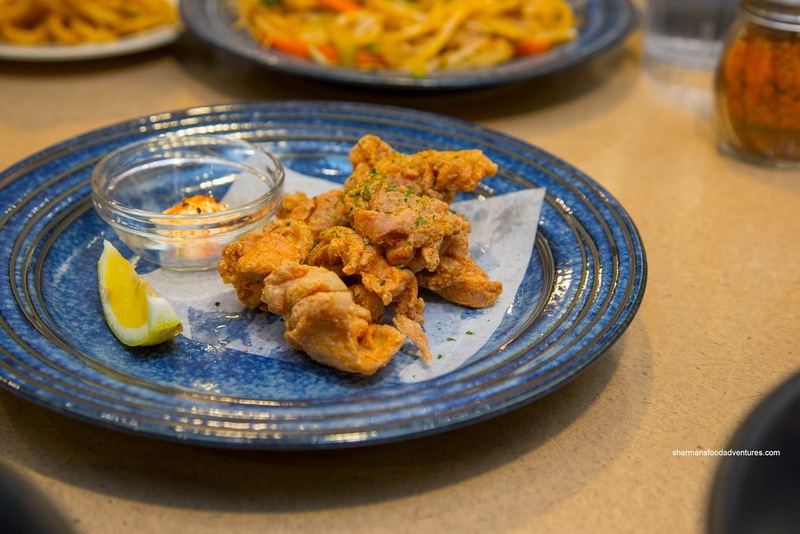 Before we got to the udon, we shared some appies including the Chicken Karaage. This was not really all that good due to the overcooked chicken. It was crispy though with seemingly more skin than meat. The lemon and mayo were quite necessary as the chicken itself wasn't seasoned enough. 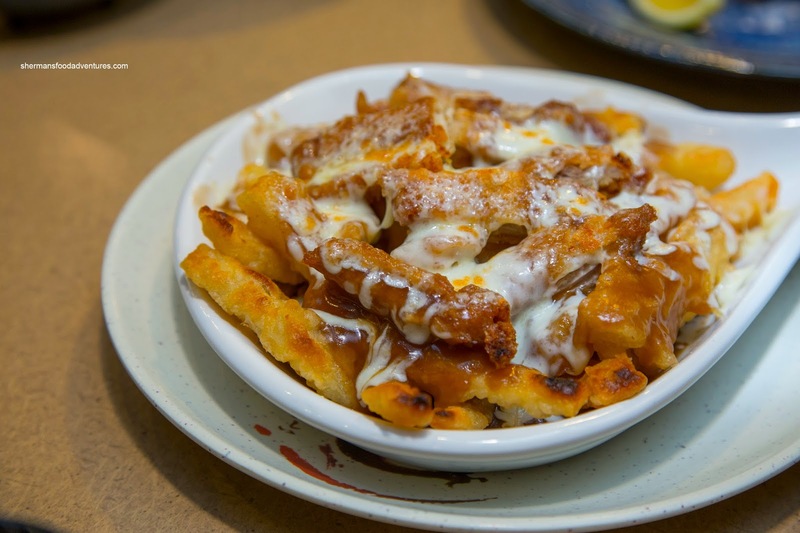 Next, we sampled something they called Japoutine which featured tempura-battered potato topped with cheese and gravy. We added chicken katsu for another $1.50. Obviously, with the gravy, the fries were not all that crispy. There was lots of cheese, that made almost every bite stringy. The pre-packaged gravy was pretty standard being thick and mildy flavoured. We found the chicken to be tender, but would've liked to see it more crunchy, so it would stand up to the moisture. One last appie was the Assorted Tempura which was curiously the same price as the prawn tempura minus one prawn (but all the veggies). 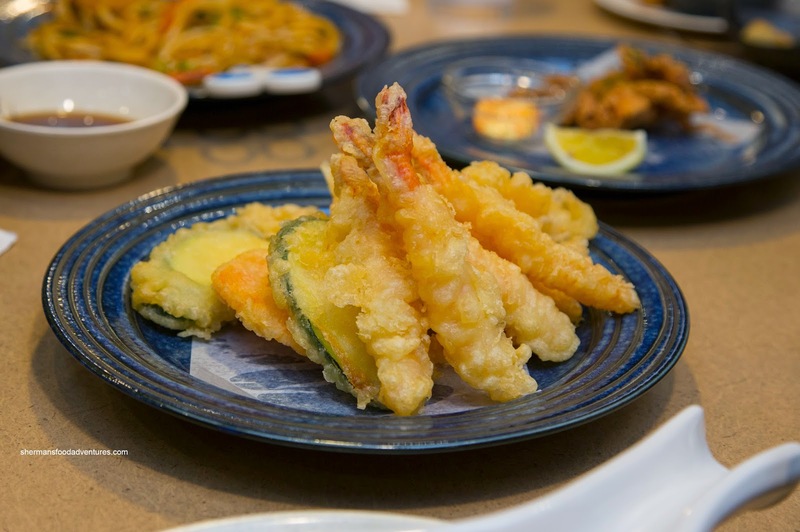 Although the veggies were the proper texture while the prawns had a buttery snap, the tempura batter was thick and dense. Hence, it was a firm crunchy rather than a light crispiness. 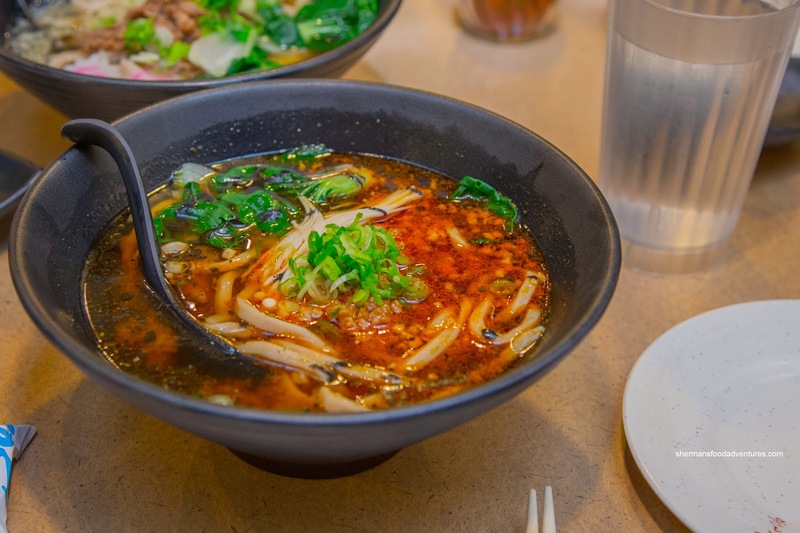 For my order of udon, I decided to try the Spicy Tan Tan in a spicy miso based soup, bean sprouts, enoki mushrooms, baby bok choy, black sesame, chili oil, chopped green onions and ground pork. Yes, not exactly a Japanese flavour I know... It did taste okay though with a vinegary tartness and a mild spice level. The combination of moist ground pork and pickled mustard greens added some depth and tang. I chose the whole wheat udon and it was soft with a slight chew. Viv had the Niku with sukiyaki braised beef, onions, enoki mushrooms, chopped green onions and baby bok choy. The dashi broth was rather sweet with a bonito finish. The modest amount of beef was sufficiently tender while the whole wheat udon was not unlike mine. For the kiddies, they shared the Tonkotsu with braised fatty pork, sprouts and baby bok choy (we omitted the green onions). 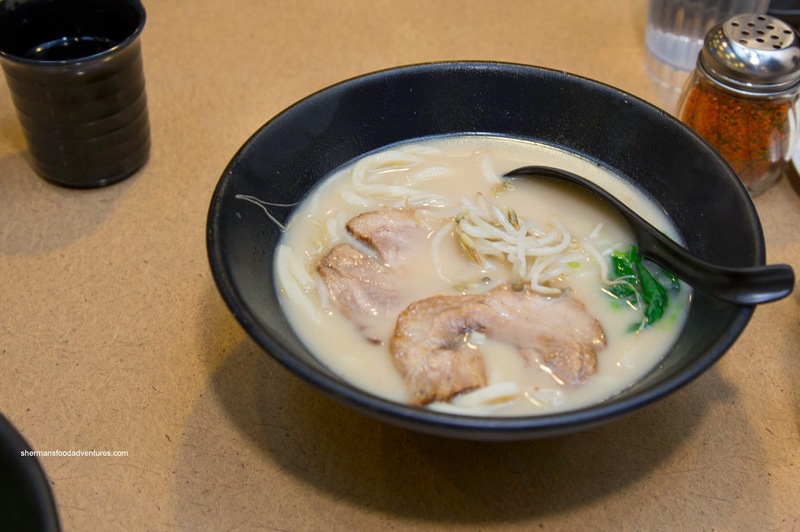 Similar to a tonkotsu raman, the broth was somewhat flavourful, but not in a rich, in-depth manner. I wouldn't go as far as saying that it relied completely on seasoning, but it didn't have that impactful and rich bone-marrow silkiness. The udon, once again, was decently chewy while the pork was fatty and succulent. Chocoholic ordered the Kitsune with with extra thick fried and marinated tofu (atsukage), enoki mushrooms, chopped green onions and baby bok choy. Indeed, the tofu was in large pieces and sweet. As for the broth, it was indistinguishable as to what it was. It did taste sweet with some dashi elements. 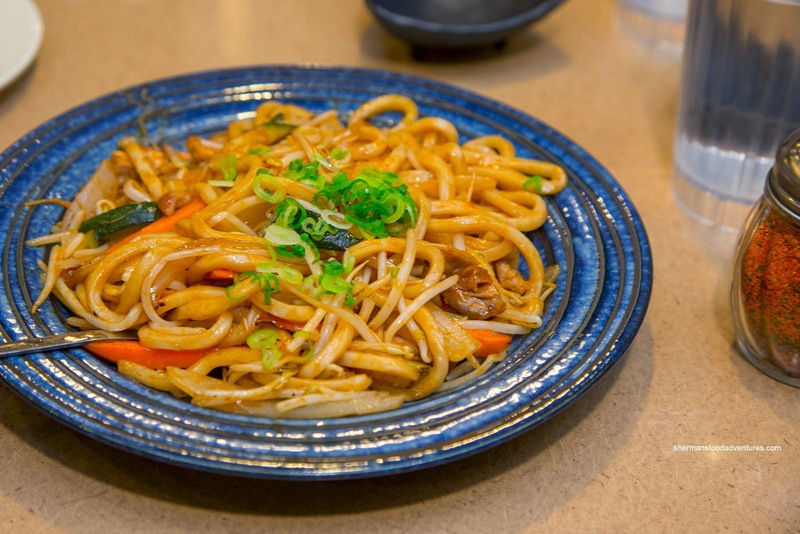 Lastly, she also tried the Yaki Udon in special sauce with chicken, zucchini, onions, carrots, chopped green onions and seaweed. For something pan-fried, the udon was a bit slimy and lacking in caramelization. The sauce was acceptable though with a vinegary hit, but the absence of a good sear meant the flavours were not impactful. Overall, we though the udon was decent while the appies to be substandard. 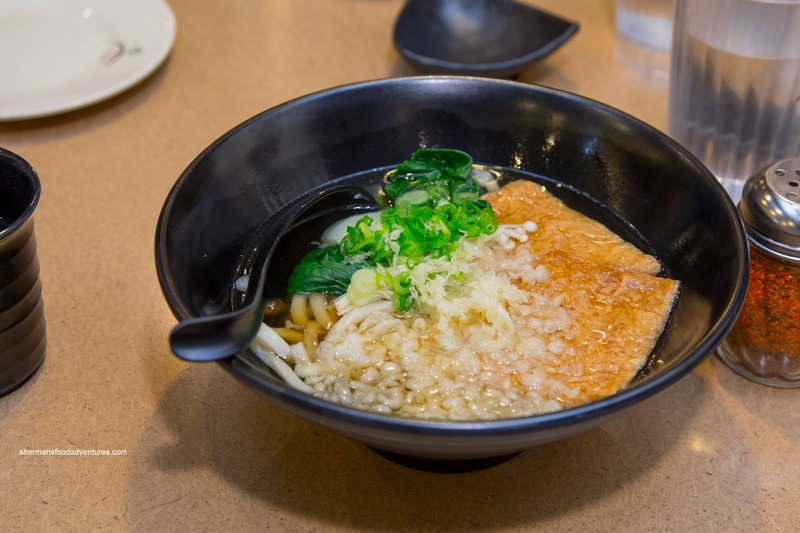 However, the biggest issue is the portion size in relation to the prices (both the Tan Tan and Tonkotsu are $11.00). Did you wonder if Sekai may simply be a re-branded Sui Sha Ya ? That thought occurred to me while reading your write-up.